Call: 844-805-8552 Take a Virtual Tour! In 2018, volatility returned to the market, with the final quarter exhibiting some extreme levels. While December is often a good month for stocks, that was not the case this year. In fact, the DOW had its worst December since 1931. At one point, the broader market nearly moved into bear market territory and basically all areas of the equity market were down for the year. While the economy continued to be relatively strong, a variety of concerns regarding such things as a potential global economic slowdown, political dysfunction and rising interest rates began to creep in and drove the volatility. The US economy continued to deliver robust gains in the third quarter. The Bureau of Economic Analysis reported its third estimate of third quarter 2018 gross domestic product (GDP) of 3.4%, in line with the prior estimate of 3.5%, but lower than the second quarter's 4.2% reading. The employment situation slowed somewhat, but continued to deliver gains, with an average of approximately 170,000 jobs added each month. At the same time, the unemployment declined to 3.7%. The Federal Open Market Committee (FOMC) continued its interest rate policy by raising the federal funds rate target 0.25% to a range of 2.25% to 2.50%. Economists expect there may be at least two additional increases in 2019 as economic growth continues to be strong, and inflation and wage pressures increase. The global economic environment has weakened slightly, and remains volatile in the emerging economies. The reasons for the slowing are attributed to the US's trade war with China and the tightening of monetary conditions domestically. The Eurozone economy suffered somewhat due to trade effects, but also as a result of a greater-than-expected slowdown in consumer spending. Japan also slowed during the quarter, with economists pointing to slow wage growth as the culprit. China's growth declined to about 6.6% (from 6.8% in 2017) as a result of policymakers' attempts to deleverage, as well as the trade war with the US. The Bureau of Economic Analysis released the third estimate of the third quarter 2018 real GDP, a seasonally adjusted annualized rate of 3.4%, down slightly from the second quarter's 4.2% annualized growth, and in line with the 3.5% prior estimate. The economy is growing at the fastest rate since the expansion began in 2009. While growth has been impressive, some analysts are beginning to warn that it is not sustainable, since the recent strength has been driven by deficit-financed tax cuts and an increase in government spending. These drivers provide a boost to growth, but economists believe that increased capital spending and productivity are necessary for sustained growth at that level. However, because of the strength of the past two quarters, the economy is on a solid trajectory, and its short-term prospects are favorable. Positive inputs such as improved incomes, benign inflation, steady home prices and the highest consumer confidence in years support the notion that the economy has more growth runway. Analysts note that an increase in the intensity of trade skirmishes, a misstep by the Federal Open Market Committee (FOMC), or a significant decline in confidence could change the trend. The housing segment has stabilized at levels off of their highs in recent months, as the increase in mortgage rates continues to dampen demand. Existing-home sales for November (the latest monthly data available) grew at an annualized rate of 5.3 million units, slightly higher than the results from October, but down about 7% from year-ago levels. The inventory of existing homes was slightly less than four months of supply, up somewhat from the prior year. Existing-home prices in November have increased 4.9% from November 2017. In the new-home segment, the NAHB Housing Market Index, a measure of homebuilding activity, ended the quarter at 56, below October's level of 60, and much lower than the levels experienced earlier in the year. In general, homebuilders have reason to remain optimistic, particularly if the pace of interest rate increases subsides and consumer confidence remains elevated. The employment situation slowed somewhat in November, but in general remains strong. Employers added 155,000 jobs during the month, well below the consensus expectations of 200,000 new jobs, and far below the prior month's gain of 237,000. The three-month moving average fell quite a bit due to the lackluster gains in November and September, coming in at 170,000. The unemployment rate in November remained at the prior month's level of 3.7%, and economists believe it will go even lower in 2019. Average hourly earnings increased by a bit more than 3% in the month. The FOMC ended its recent December meeting by announcing an increase of 0.25% in the federal funds rate target range to 2.25% to 2.50%. The rate increase was widely expected, and was the ninth time since 2015 that the committee has raised rates. The committee modified the language in the statement accompanying the increase, indicating that there would be "further gradual increases in the target range," replacing the previous language that was more hawkish. The committee also noted that it expects to increase short-term rates twice in 2019. Fixed income securities' prices and yields were affected by numerous factors during the quarter, some of which were holdovers from prior quarters, but others which arose during the quarter. Questions about the future health of the economy, the FOMC's decision to raise short-term interest rates once again at its recent September meeting, and President Trump's public displeasure with FOMC Chairman Jay Powell were a few of the drivers impacting the bond market. In addition, even though job growth tailed off somewhat in November, it still remains robust, with unemployment at historically low levels. Wages have also been trending higher, which is usually a precursor to higher inflation, something the FOMC is willing to accept, but only up to a point. Most analysts, and the FOMC itself, expect there will be two more rate increases in 2019. 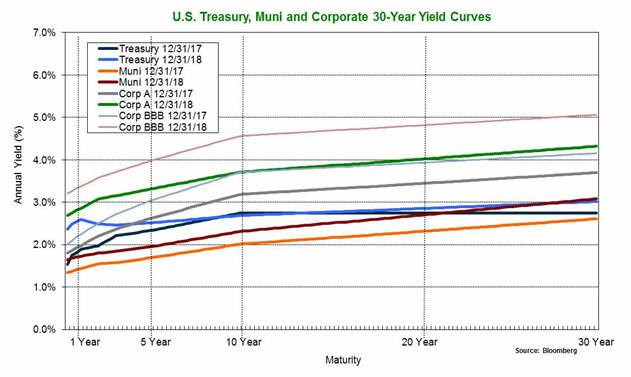 As with the prior quarter, the Treasury yield curve flattened somewhat during the third quarter, with yields on short-term maturities rising and those on intermediate-term maturities climbing. By the end of the quarter, the yield on the benchmark 10-year US Treasury note was lower, ending the quarter at 2.69%, compared to 3.06% on September 30. As mentioned above, interest rates in the quarter moved to the competing drivers of an economy still growing robustly, the unwinding of the Federal Reserve's balance sheet, and the steady normalizing of short-term rates by the FOMC. Fixed income market movements were muted in December in the face of a partial government shutdown due to wrangling over funding of the border wall. Yields were stable to slightly higher from the beginning of the quarter until election day in November, at which time they started to decline steadily as equity investors began to re-allocate assets. Inflation expectations rose modestly, with the Fed's gauge of five-year forward inflation expectations declining sharply to 1.82% from 2.13% on September 30. Equity markets took it on the chin during the quarter, posting the largest quarterly decline since the fourth quarter of 2008. There was no â€œSanta Claus rallyâ€� this year, as stocks also suffered their worst month of December since the Great Depression, despite also generating the largest single-day point gain in history on December 26. Analysts point to a number of factors causing the volatility and lower prices, including fears of a recession in 2019; FOMC aggressiveness in raising interest rates; Democrats taking back the House of Representatives in the mid-term elections; and President Trump's publicly expressing displeasure with FOMC Chairman Jay Powell. All of these conspired to spook investors into taking profits earned as part of the longest bull market in history. During the quarter several broad-based indexes declined more than 20% from their respective peaks, a widely cited threshold indicating those indexes are in a bear market. Within this landscape, the S&P 500 Index finished the quarter with a decline of -13.5%, and posted a total return of -4.4% for 2018. The ten primary economic sectors produced performance results that were extremely weak during the quarter. Utilities, Consumer Staples and Health Care were the strongest performers on a relative basis, generating returns of +1.4%, -5.2%, and -8.7%, respectively. The Energy, Industrials and Information Technology sectors were the poorest relative performers, posting returns of -23.8%, -17.3%, and -17.3%, respectively. The Russell 1000 Index of large capitalization stocks generated a -13.8% total return. Within the large cap segment, growth stocks underperformed value stocks. Small cap stocks, as represented by the Russell 2000 Index, again far underperformed large caps, and finished the quarter with a total return of -20.2%. Small cap value outperformed small cap growth. The NASDAQ Composite, dominated by information technology stocks, finished the quarter with a loss of -17.3%. The Dow Jones Industrial Average of 30 large industrial companies shed -11.3%. Real Estate Investment Trusts (REITs) also lost ground during the quarter, with the DJ US Select REIT Index giving up -6.6%. Commodities were also lower, with the Bloomberg Commodity Index declining -9.4% for the quarter. International stocks generally posted results in line with US equities. Economic growth is behind that of the US, and the Eurozone is still grappling with how the UK's departure from the European Community ("Brexit") will finally play out. The MSCI ACWI Ex-USA Index, which measures performance of world markets outside the US, declined by -11.5%. The MSCI EAFE Index of developed markets stocks dropped by -12.5%. Regional performance was also poor for the quarter. 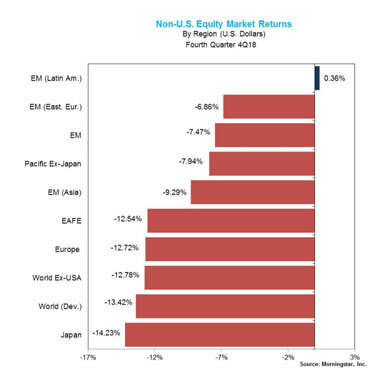 Latin America was the strongest performer on a relative basis, with a return of +0.4%. Japan was the poorest performer, falling -14.2%. Emerging markets performance was again negative, as the MSCI Emerging Markets Index was lower by -7.5%. The US economy continues on a solid trajectory, fueled by last year's tax cuts and an increase in government spending. These fiscal stimulants have enabled the economy to grow at roughly a 3% rate in 2018, and have contributed to the addition of about two million jobs during the year. The consensus among economists is that the trend is likely to continue into 2019, albeit at perhaps a slightly lower rate of below 3%. Analysts expect employment gains to continue as well, enough that the unemployment rate should drop to around 3.5%. The FOMC is also expected to continue raising rates, somewhere between two and four 0.25% increases, with the number depending on the strength of the economy at the time. As we head into 2019, there are a number of risks of which investors should be mindful, including the ongoing trade war with China, which so far has not done significant damage to the economy. However, if it were to escalate, the adverse impact would be more consequential. Another risk is the outcome of the UK's Brexit negotiations with their European counterparts. Most analysts believe the UK will come to an agreement that will ultimately have little impact on the US economy, but until it is finalized there is likely to be some volatility as a result. The return of volatility was widely anticipated, but perhaps not quite at the levels seen in 2018. We feel it is prudent to buckle up and expect continued volatility in 2019. Please be sure to let us know if you have any upcoming cash needs from the portfolio that we are not aware of or if you feel your portfolio is no longer appropriate for your situation. A volatile market can be very disconcerting so please feel free to call us if you have any concerns about the markets or your portfolio. See Important Disclosure Information | Privacy Notice | Legal | Form ADV ©2019 Ramsey & Associates, Inc. All Rights Reserved.